Southampton Boat Show, Sunday 13th September. 31 different classes represented, six current Champions. Let Battle Commence. 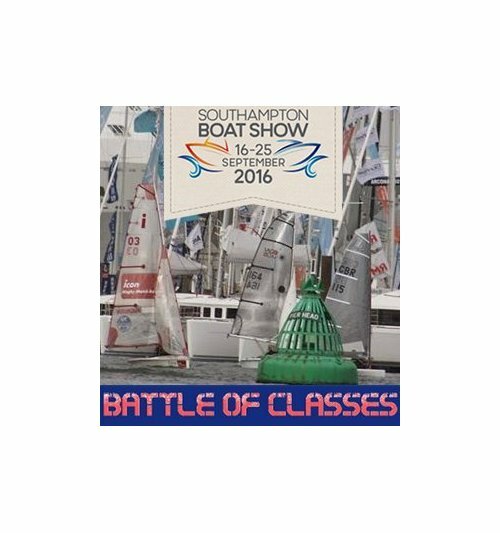 The 2015 Battle of the Classes, kindly hosted by the Royal Corinthian Yacht Club and Southampton Water Activities Centre (SWAC), will see 35 boats representing 31 Dinghy Classes, race in front of the Southampton Boat Show. This annual 100 minute pursuit race will see staggered starts depending on each boat’s RYA Handicap. First off at 13:00 will be the Topper class, led by 2015 National Champion Eleanor Poole from Starcross (Devon). 14 year old Eleanor made history at the 2012 Olympic Venue in Weymouth this summer by becoming the first female National Champion of this ever popular class. The 2015 Battle of Classes has attracted a great cross section of boats from Toppers to International 14s, representing the diversity of the UK dinghy scene. A wide variety of design configurations are represented, including single and double handers, asymmetric and symmetric spinnakers, hiking and trapeze boats. Joining Topper National Champion Eleanor Poole, there are several other current class Champions, including David Acres (RS300), Dan Holman (D-Zero), Jonathan Carter (Vortex), James Grummett (29er), Jack Berry (Topper 4.2). In additional to these, many of the other competitors regularly appear in the top five at their respective Class Nationals and/or are previous winners, including Mike Lyons (Blaze) and Archie Massey (I14), a multiple World Champion in this historic class. The weather forecast is set for some sunshine with a moderate but gusty and shifty breeze that could favour some of the more slower boats, unless the really fast craft like the 505 and I14s manage to stretch their legs. With the I14 starting some 42 minutes after the Toppers and less than an hour to catch up, it could be set for a very exciting finish at 14:40. SailRacer will be providing commentary to the Southampton Boat Show crowds and live GPS tracking, viewable on the Battle of the Classes Event Website. Spectators will be able to see the race from the Boat Show marina or other waterside vantage points. The Battle of the Classes will also form part of the MUSTO Speed Challenge, with £1,000 of great MUSTO Dinghy Kit to be won by whoever posts the top adjusted speed as recorded by the SailRacer trackers. With speeds adjusted to handicaps, all boats have a chance of scooping one of three prizes. Mike Lyons (Blaze) has topped the MUSTO Speed Wall for some time with a Mirror in second place. The prizegiving will take place at 17.30 on the Guinness stand (Zone C), Southampton Boat Show where the 20015 Battle of the Classes champion will be announced. For visitors and spectators to the Southampton Boat Show, doors open at 10am.